Now you will find zombies during the day. CrackedZombie 1.12.2 and 1.11.2 is a mod that adds a new being which looks like the normal zombie but can be different in three things. The first one is that it will be walking by the world under the sunlight, the second one is that they will attack the chickens, pigs and obviously you. And the third one is that they have a different way of walking than the normal zombies since they don’t raise its arms. 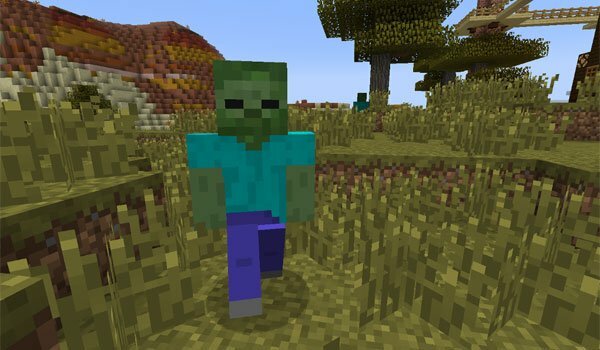 These zombies do not have special features, what they just have different is that they can roam the world during day, so if you’re looking to add some more action in your Minecraft worlds, you might be interested in this mod, since the bounce rate of zombies has increased. How to install CrackedZombie Mod for Minecraft 1.12.2 and 1.11.2? Zombies wandering during the day in Minecraft! No, no you do not have to have the paid version. First cnhage the filename of the skin you want to use to char.png . Then use Winrar to open the .minecraft file. then in the mob folder, replace the file char.png with your new one. Before you close winrar, delete the folder META-INF . Admin lies, you do NOT need the paid version.